In July of 2011, the Perico Life Insurance Company combined operations with HCC Life Insurance Company. Both are subsidiaries of HCC Insurance Holdings Incorporated. The parent company, HCC Holdings, founded in 1974, is a global specialist in the insurance industry and now boasts assets of more than $9 billion, making it one of the largest insurers in the United States. All new and existing Perico accounts will now be administered by HCC Life through their regional branch offices. Perico Life’s principal insurance product is a medical loss prevention plan styled for companies who self-insure their employee benefit programs. Perico also markets health, accident, and life insurances through its HCC Holdings partners. A.M. Best Company rates HCC and its affiliates as A+, superior, for financial stability and creditworthiness. Best gives HCC an aa- stable, credit rating. Fitch gives HCC high marks as well, with an A+ default rating, an A for unsecured debt and AA, very strong, for financial strength. Standard & Poors also ranks HCC as very strong, AA, based on the company’s underwriting capabilities and HCC’s high level of profitability. Within each category above, HCC writes many different lines of business. HCC Insurance Holdings’ website features a link to careerbuilder.com, which opens on the page featuring professional positions that are available throughout the HCC Holdings organization. The HCC Life website provides a detailed company overview. Current financial information and graphic representations of the company’s recent history are available. HCC Life has shown consistent growth since its establishment in 1974. 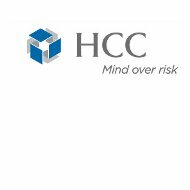 In the last five years, HCC Life has seen more than a 6% growth in net premiums. HCC Life loss ratios remain consistent for the insurance industry and HCC Life expense ratios are, on average, 10% lower than those of their peers are. Principal business lines for HCC Life include group life insurance and accidental death and dismemberment programs. They also cover excess risks for HMO’s, and like their sister company Perico, HCC Life specializes in medical loss reduction and provides short-term medical coverage for domestic and international travelers. HCC Life provides accident and health insurance coverage to more than 10 million people. Stop loss medical coverage protects a company that self-insures, against excess losses. These losses are generally hard to predict or the result of a catastrophe. Taft-Hartley stop loss coverage protects trade union plans. HCC Life is a specialist in this area. The company supports its entire product line by being financially strong and expert in providing quality service to all of its clients. HCC Life offers a competitive and affordable group term life insurance program for its employer clients. Employees may choose coverage for themselves and their dependents. Coverage for accidental death or dismemberment may also be selected through HCC Life employee benefit plans. HCC Life also specializes in medical reinsurance and is a leader in HMO reinsurance in the US. Finally, HCC Life is a leading provider of international medical and travel medical insurance coverage. Insurance plans and rates for travel within the US and abroad are readily accessible by clicking on, http://www.hccmis.com/. Domestic travelers insurance is available for as little as $1 per day. A program designed to assist clients who are traveling or living abroad, includes a diverse package of helpful and necessary services, and is offered at no additional charge for international clients.